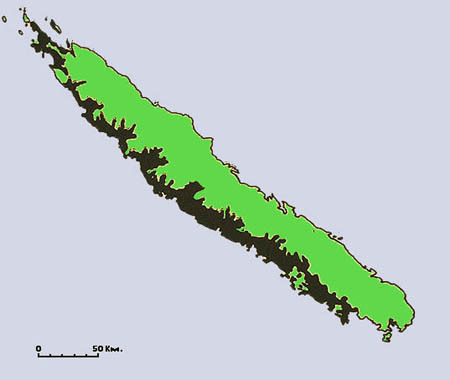 Threats to New Caledonias native vegetation. 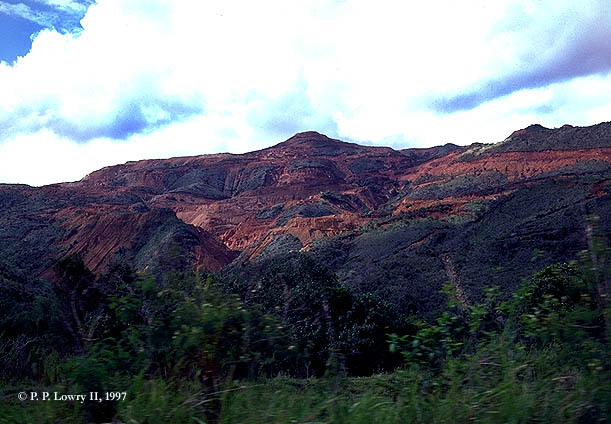 Top row, left to right: Effects of nickel mining (Montagne de Poum and Mines de Thio). 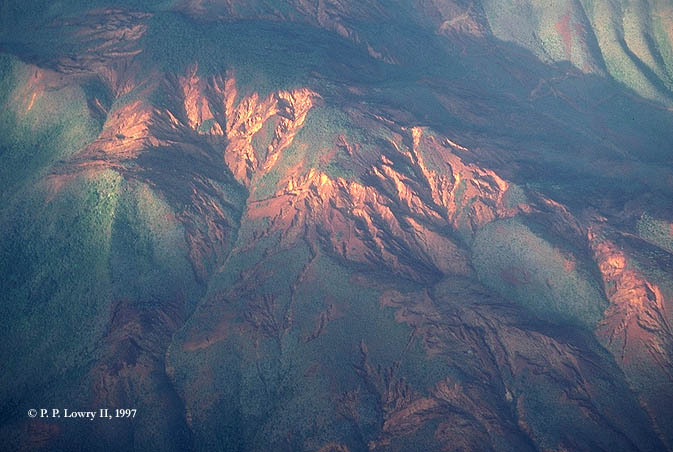 Bottom row, left to right: Human-caused fire in degraded maquis (east of Nouméa); erosion in areas subjected to regular burning (Mont Dore). Only one vegetation type on New Caledonia is seriously threatened today: sclerophyllous forest. Some logging and land clearing effect small areas of moist evergreen forests, and nickel mining (which was much more extensive during the "boom" of the 1960s and 70s) is highly destructive, but mostly localized. 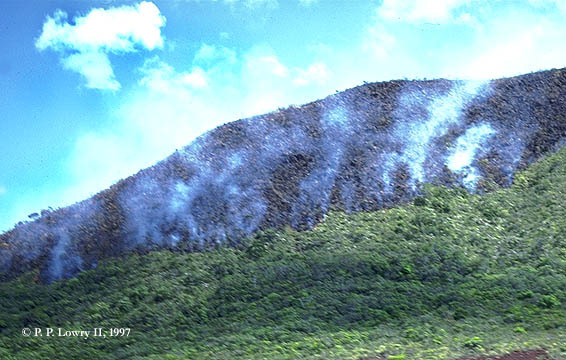 The maquis vegetation is more vulnerable to widespread fires (often set by humans), especially during the dry season in areas with low precipitation, resulting in varying amounts of degradation to an apparently rather small part of the formation. 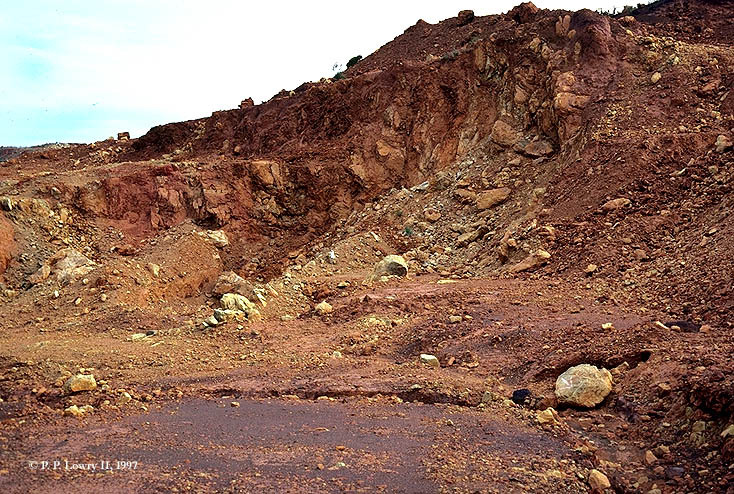 Mining has also taken its toll on maquis at many sites, resulting in degradation or total destruction. However, because the maquis is almost exclusively restricted to ultrabasic substrates, which are essentially useless to humans (especially for agriculture), it is otherwise only slightly impacted. Mangrove, swamp vegetation, and other native formations, most of which do not contain high numbers of locally endemic species, are also relatively unthreatened at present, although individual sites are vulnerable to many kinds of destructive activities. 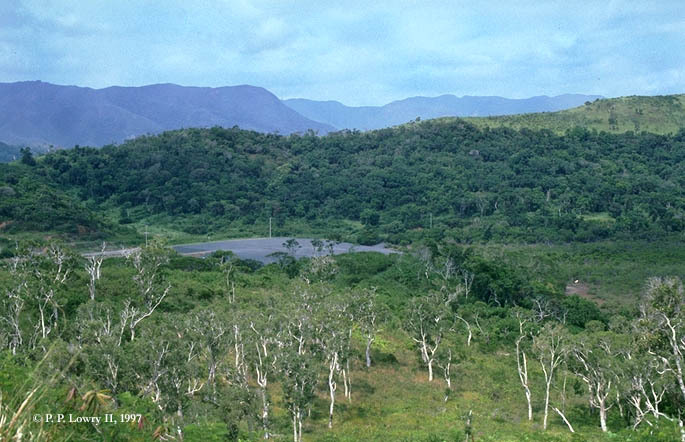 Sclerophyllous forests, New Caledonias most threatened vegetation type. Top row, left to right: Remnant stand at Beaupré, south of Poya; relictual forest at Népoui, west of Poya. 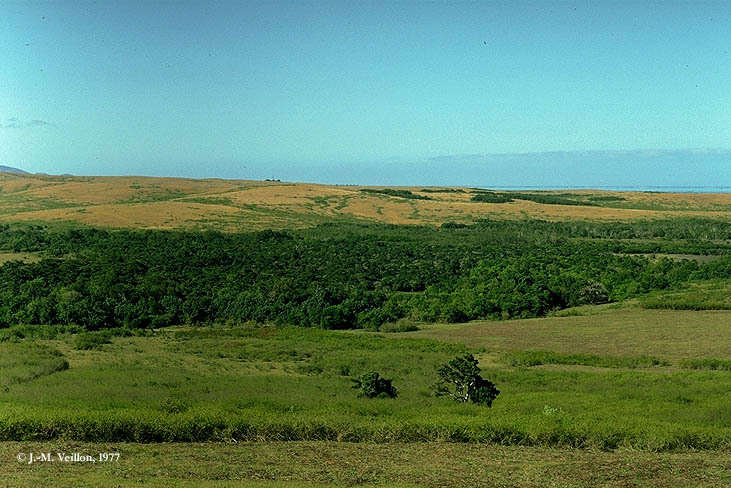 Bottom row, left to right: Partially degraded forest at Baie de Tina, near Nouméa; remnant stand on private land being cleared for cattle grazing, southwest of Pouembout. The conservation status of New Caledonia's sclerophyllous forests is far more serious. 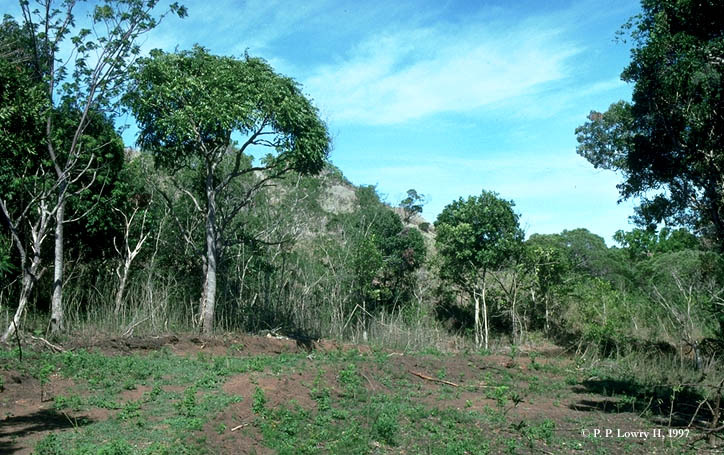 The history of destruction that has ravaged this unique vegetation type, and the plight of the last few remaining stands, were reviewed by Bouchet et al (1995), who made an urgent call for immediate action. 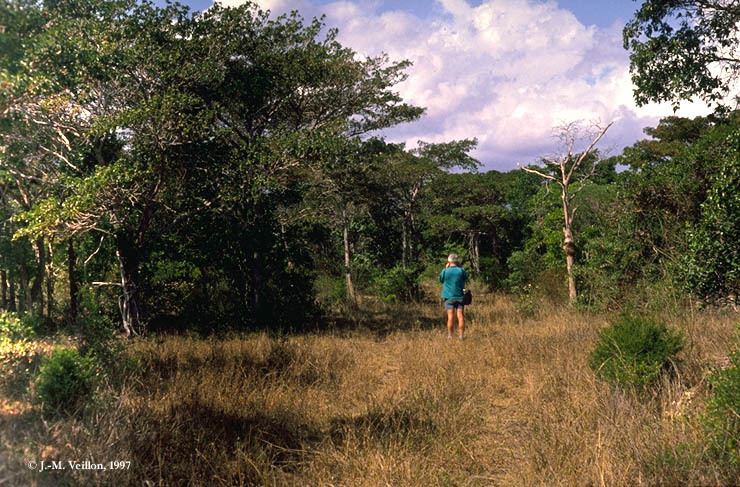 Estimated original cover of sclerophyllous forest (left) and remaining stands (right)(Source: Jaffré et al., 1987). Only about 100 km² (2.2%) of the original ca. 4,500 km² of sclerophyllous forest remain in a more-or-less undisturbed state, with another ca. 250 km² (5.6%) moderately to heavily degraded, and highly secondarized. The remaining stands are also very small (mostly less than 5 ha, and never more than 200 ha), and are highly fragmented and scattered along the west coast of Grande Terre and on a few of its associated islands (Jaffré et al., 1993), which presents additional problems for their continued viability. The causes responsible for the destruction of nearly all New Caledonias sclerophyllous forest are the same as for many other dry tropical forests (cf. 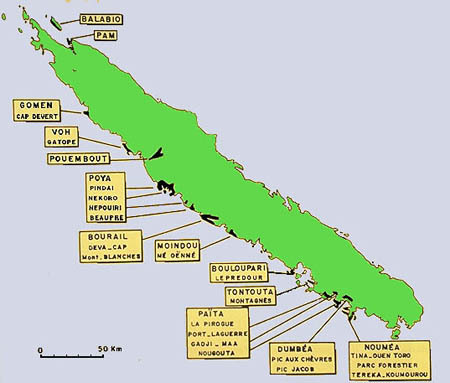 Humbert, 1935), which are regarded as among the world's most threatened habitats (e.g. Janzen, 1988). Much of the vegetation cover was apparently badly degraded or destroyed by fires set by humans since they first arrived ca. 3,500 years ago, but the process was intensified following French colonization in the mid-1800s as lowlands were cleared and burned for various agricultural activities, including cattle grazing. The introduction of the highly successful Indonesian deer in the 1880s accelerated the destruction as these animals (along with cattle and goats) impede or prevent the regeneration of many plant species due to trampling and grazing (Bouchet et al., 1995). More recently, the regular and uncontrolled spread of huge wildfires, often intentionally and illegally set during the dry season as a form of political protest or to facilitate new spring growth of herbaceous species for hunting, has increased the pressure and vulnerability of the last remaining stands of sclerophyllous forest to an alarming point. The impact of these destructive forces is worsened by the fact that the flora of the sclerophyllous forests is clearly insular in nature. Unlike the other principal vegetation types present in New Caledonia, this formation, especially when it has been even slightly degraded and opened up, is highly susceptable to invasion by aggressive, exotic species (e.g., Cryptostegia grandiflora, Lantana camara, Leucaena leucocephala, and Psidium guajava), and even a few native taxa, most notably Acacia spirorbis (Bouchet et al., 1995). Rapid colonization by weedy species, in conjunction with the effects of burning, clearing, and damage from introduced hoofed animals, essentially prevents re-establishment of the original sclerophyllous forest, at least within a period of many centuries. Because such a high proportion of New Caledonia's native plant species are endemic, the effects of habitat destruction on global biodiversity are correspondingly large. As in many tropical environments, this is compounded by the fact that a large number of these endemics have highly restricted distributions, occurring in only one or a few localities, and often in a very limited number of small, localized populations. A striking example is the recently documented extinction of Pittosporum tanianum, which was know from only a few individuals on Leprédour Island (Bouchet et al., 1995). Based on a survey of the published volumes of the Flore de la Nouvelle-Calédonie et Dépendances, which cover about 32% of the native angiosperm and gymnosperm flora, Bouchet et al. (1995) list 15 species from various vegetation types that have not been seen in the last 80 years, many of which are presumed to be extinct. Perhaps twice as many occur in the groups that have not yet been treated in the Flore, which would bring the total number of extinct species to nearly 50. Many others must have been lost even before they could be documented by botanists, including plants that were confined to the formerly widespread sclerophyllous forests, and especially those occurring on basaltic substrates, which have now been completely destroyed (Jaffré et al., 1993). Today, essentially all of New Caledonia's hundreds of highly restricted micro-endemics are vulnerable to local disturbance, regardless of the vegetation type or the substrate on which they grow.